The Oasis is a resort organized around principles of human and planetary health. 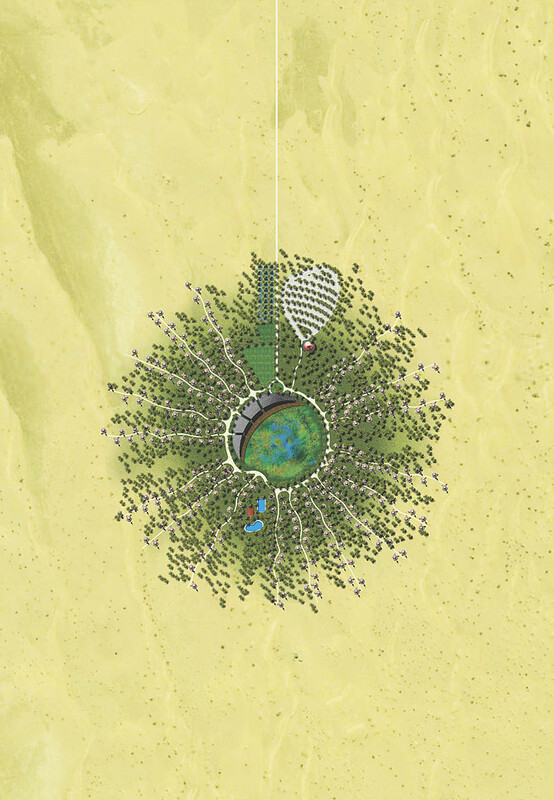 Centered on a constructed oasis, the resort will offer a wide range of recreational and therapeutic activities focused on the magnificence of its desert site. These are to include carefully conceived and healthful cuisine, complementary, holistic medical treatments, a spa, a range of opportunities for exercise, and an educational program focused on the interaction of human and natural ecologies, with emphasis on appreciating the complexities of the desert. The resort itself is to be a model of environmental best practices, generating its own energy from sun and wind, embodying traditional means of construction and climate control, using its water with great care, managing its own wastes, and growing food and medicinal herbs. The Oasis is to be both a luxurious and delightful resort and a prototype for sustainable community and architectural design.